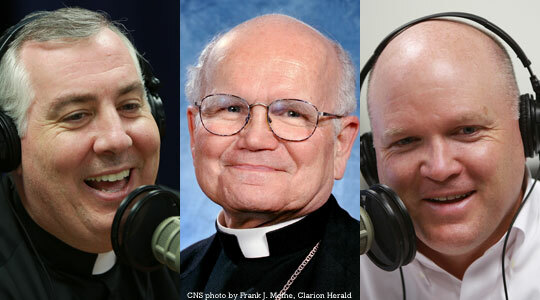 Summary of today’s show: Archbishop Alfred Hughes notes eight times in his life–from his hometown of West Roxbury to the Archdiocese of New Orleans – where God led him in ways he resisted at first, but which later turned out for the good (of course). The archbishop-emeritus of New Orleans talks with Scot Landry and Fr. Mark O’Connell about growing up in West Roxbury; how his father’s example led him to the priesthood; when he wanted to be a missionary but ended up a diocesan priest teaching in the seminary; the talk he had with Pope John Paul II when he first balked at being asked to be a diocesan bishop; and the Church’s response to Hurricane Katrina and how it held the fabric of New Orleans together in the aftermath. 1st segment: Scot Landry and Fr. Mark O’Connell talked about having a holiday in the middle of the week and how they celebrated their Independence Day. Fr. Mark talked about having a separated shoulder after his recent fall. Today’s guest confirmed Scot about 25 years ago and was rector of the seminary when Fr. Mark was there. Archbishop Alfred Hughes became archbishop of New Orleans after being a priest and auxiliary bishop in Boston. 2nd segment: Scot and Fr. Mark welcome Archbishop Hughes. Archbishop Hughes expressed concern for Fr. Mark’s shoulder. Scot said he and his twin brother, Fr. Roger Landry, had their confirmation names Theophilus and Deodatus. They had lost a bet with Fr. Lenny O’Malley and so he got to name them and Archbishop Hughes wanted to call Scot by Theophilus during the show. He said he’s disappointed because he’d thought Scot and Fr. Roger had come to those names by intense study. Archbishop Hughes was born in Boston. He grew up in St. Theresa’s parish in West Roxbury. It was during the post-Depression times, but everyone was going through the same thing and he didn’t see himself as any poorer than anyone else. His father had lost his job as head of sales for the new automatic washing machine. He was out of work for a couple of years and then worked for the WPA for 10 years. But never knew about the stress they were going through. They were tremendous parents, evidencing faith in an explicit way. He recalls finding out how his father got up every morning before everyone to pray and it led him to a contemplative wisdom about life that he passed on and this was formative to Archbishop Hughes being open to the priesthood. Every Friday night, before religious education on Saturday morning, his father would sit down with the four children and go over the Catechism lesson. He would then set it aside and ask them what their answers meant. then he would go on to tell them what that teaching meant to him, using examples from family life, in the neighborhood, or in his work. That left a deep impression on the archbishop that were was not intended to be any gap between God’s teaching and the living of ordinary life. He went to Boston College High School, which was his first Catholic school. His parents scraped together the tuition. He’ll be forever grateful in both the classical education and the opportunity to learn a lot more about the faith. One of the Jesuits had just returned from being a missionary in Jamaica and they used to draw him out about his experiences. Archbishop Hughes considered becoming a Jesuit, but his brother eventually did go on to become one. He entered the diocesan seminary because he wanted to stay close by his mother who was sick. But then he was asked to go to Rome to study, but his spiritual director told him that the greater gift to God might be to say Yes to what his superiors were asking him to do. After ordination, he got a doctorate in spiritual theology. When he came back to Boston, he became a professor and then rector of the seminary. He was also an auxiliary bishop. Scot said it probably wasn’t what the archbishop expected for his priesthood. Archbishop Hughes can count eight other times in his life when his superiors asked something of him that given his own preferences he would not have chosen. Yet each one of them is a way in which God has worked in his life and stretched him beyond what he thought he was capable of. He said the irony is that after Hurricane Katrina, the Archdiocese of New Orleans was declared by the US bishops to be a missionary diocese to qualify for aid. God eventually allowed him to become a missionary. Also his mother died one month before he left Boston, so he’d been able to care for her. Fr. Mark noted that Archbishop Hughes’ closest friend in the priesthood is Msgr. Connie McCrae. Archbishop Hughes said no matter where each has been, they’ve talked on the phone once per week. Later this month, they will vacation together in Marshfield. He’s also been able to visit Msgr. McCrae in Rome during his assignment there. They talked about the racquetball rivalry between the archbishop and the monsignor. They’ve been playing since the mid–1970s. The Archbishop still plays a couple of times per week even at 78 years old, while he think Msgr. McCrae is getting rusty living in Rome where they can’t play. The archbishop now lives in the seminary in New Orleans and plays against the seminarians. Scot said for his first 60 years the archbishop either was living in Boston or studying in Rome. He asked what it was like to live Boston to go become bishop of Baton Rouge. Archbishop Hughes said there are a lot of similarities between Louisiana and Boston despite the differences. He said the greatest challenge was going to Rome to study: He didn’t know Italian, he was going to have take his classes in Latin, he didn’t know any of the other students. After that, every other adjustment, including the one to Louisiana pales in difficulty. After that he was convinced he could live in anyplace. When he got the call from the nuncio to go to Baton Rouge, he asked him if the pope knew how different the two areas are and said it would be difficult for the people to accept him. He was leaving that night with four busloads of kids to go to Denver for World Youth Day, so the nuncio told him to talk it over with the Pope. He did in fact and the Pope assured him that he wanted him to go to Baton Rouge. Going to Baton Rouge was a wonderful experience. Louisiana is different in terms of history–originally a French colony and influenced by the Acadians–but there are many similarities, especially in New Orleans where there are historically ethnic neighborhoods like Boston and a rich Catholic history. The culture of south Louisiana was originally Catholic where in Boston it was originally Protestant. So even the Baptists and Evangelicals think like Catholics, unlike what has happened in the Northeast. It is a rich town for the arts and music and food and sports, much like Boston. Fr. Mark asked if the archbishop going from Baton Rouge to New Orleans helped out in having Baton Rouge help out New Orleans after Katrina. His successor in Baton Rouge had been vicar general in New Orleans. For the first four months after Katrina, he could not get back into New Orleans so they set up the diocese-in-exile in the offices of the diocese of Baton Rouge. In that 4 month period, they distributed almost 40 million pounds of food to people who had next to nothing. Because of the generous national collection, they were distributing basic, fundamental subsistence help at the rate of $200,000 per week through 12 centers they set up. The priests were encouraged to see themselves as pastors of virtual parishes and to be in contact with parishioners wherever they might be, to let them know they were still connected and see to their new needs. Archbishop spent half his time in Baton Rouge administering and the other going down to New Orleans to celebrate Mass with people and provide a sense that God was present and cared. After getting the fundamentals of food, clothing and shelter, people craved meaning and to know that God was there to work together to rebuild. The partnership was an extraordinary collaboration between the dioceses. Scot asked how New Orleans stands compared to right before the Hurricane in 2005. Have people generally returned to where they lived? Archbishop Hughes said 85% of active Catholics are back in the archdiocese on the basis of the annual October census of parishes. They’re not necessarily in the same parishes. A number of people have relocated elsewhere. One of the great losses in Katrina were middle-class Catholic blacks. A number of those who had gone to the Catholic schools had moved to the middle class. After Katrina many were offered attractive jobs elsewhere in the country and lost a fair percentage of the the black Catholic leadership. About 20% of Catholics in New Orleans historically have been black. This is in large part because French plantation owners baptized and catechized the black slaves. It’s also due to some free blacks who came from the islands in the Caribbean who came to live in New Orleans. The public schools have a sad record in New Orleans, although post-Katrina even there they have made good progress by rebuilding the school system. Eighty percent of public schools are charter schools. They are making progress every year, even though they started far behind. The charter schools have a two-year sunset clause in that they have to show progress in student achievement or lose their charter to someone else. This is now being extended by the state government to the rest of the state. Ninety-eight percent of those who went to Catholic schools went on to college and better jobs. He looks at the diaspora as a gift to the rest of the country. Scot noted that political commentator, Mary Matalin, who lives in New Orleans with her husband James Carville, said that New Orleans would not have had the recovery it did without the Church. Matalin recently became Catholic. Archbishop Hughes said Matalin and Carville didn’t move back to New Orleans after Katrina and didn’t see the immediate aftermath, but he agrees that what the Church was able to do by the grace of God made a huge impact. For example, the public schools didn’t open for a year, while Catholic schools began to open in October, just a month or two after the hurricane, one at a time. They welcomed public school students free of charge. Later a bill was passed that allowed the government to reimburse schools that accepted the students, but they had no idea at the time they would get reimbursed. Fr. Mark asked the archbishop about what he’s up to today. Archbishop Hughes is a spiritual director for seminarians in New Orleans. He’s also active in Vox Clara, the liturgical commission created by the Vatican to provide assistance with translation of the liturgical texts for use in English. They discussed the new translation of the Mass and the perceived complexity of the texts. Archbishop Hughes also teaches a course each semester at Notre Dame seminary. He also does retreat ministry for laypeople, priests, and bishops. He really enjoys very much being able to focus on those dimensions of life that I couldn’t always focus on the administrative roles he had. He hopes it’s a way of God preparing him for his final days, that through this ministry it helps him to keep God first and foremost and make that final gift to God. Scot thanks Archbishop Hughes for always saying Yes to God and for sharing his story with the listeners of The Good Catholic Life. Scot said both reading speak of rebellion: the rejection by the Israelities and the rejection of Jesus by the people who should have been the most receptive to him. Jesus models for us how we overcome rejection to keep bringing the good news to people who will receive it. Fr. Mark said Moses had to put up with the hardheartedness of the Egyptians and then 1,000 years later it’s the Lord’s own people who are hardhearted, but Ezekiel preaches anyway. Fr. Mark say the reason Jesus can’t perform a miracle in his own town is that the people lack faith. Usually in the Gospel Jesus says to the receivers of the miracles that their faith has healed them. Fr. Mark says we too can be hardhearted. We can treat Jesus for granted in the miracle of the Mass. Scot asked us to imagine someone who comes to our parishes because of what they’ve heard and to ask what they will experience. Many converts talk about how they don’t see fervor in the people. Scot and Fr. Mark compared how Archbishop Hughes went where he didn’t expect to go and it turned out great.